The Smoky Hill Valley area lies within two major physiographic provinces-the Central Lowlands province and the Great Plains province. The area east of a north-south line drawn approximately through Solomon lies in the Osage Plains section of the Central Lowlands province, and the area west of this line lies in the Plains Border section of the Great Plains province. The strata in the central Kansas region dip gently to the west, but have been beveled by an erosional plain that slopes eastward. The Osage Plains are distinguished by many east-facing escarpments that trend roughly north-south. The edges of westward-dipping hard limestones form the escarpments, between which are gently rolling plains underlain by the softer shales of this region. Immediately west of the Osage Plains is an area in which moderately hard thick sandstones, clays, and shales of Cretaceous age overlap the beveled Permian strata. This area has been called the Smoky Hill Upland and is the eastern part of the larger Plains Border section. 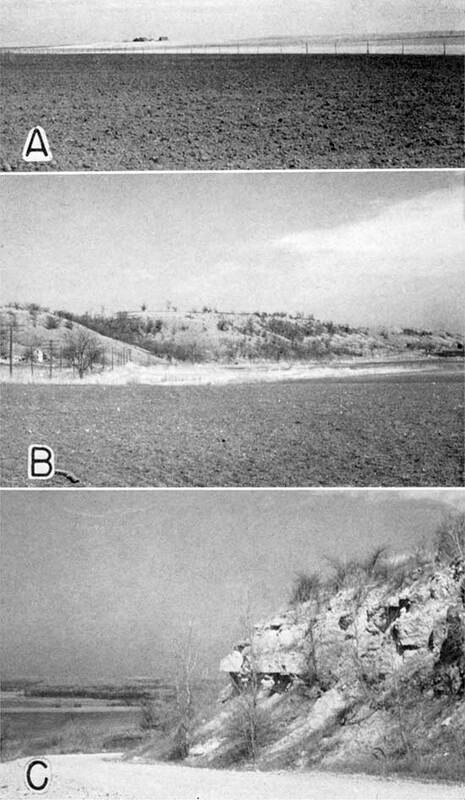 The hard sandstones exposed in the Smoky Hill Upland form an east-facing escarpment somewhat similar to the limestone escarpments of the Osage Plains, although it is less regular and there are numerous outlying hills. A line of such hills on the west side of Smoky Hill Valley in south-central Saline County is known as the Smoky Hill Buttes (Pl. 2A). Other prominent outlying sandstone-capped hills in this area are Iron Mound southeast of Salina and North Pole Mound north of Salina. Coronado Hill northwest of Lindsborg is the southernmost prominence of the Smoky Hill Buttes. Plate 2--A, View looking north along the Smoky Hill Buttes from the top of Coronado Hill (sec. 31, T. 16 S., R. 3 W.). The hills are capped by hard brown Cretaceous sandstone (Kiowa shale) and the gentle slope at the right is underlain by soft Permian shale (Wellington formation), B, Abilene pumping station on the north bank of Smoky Hill River, about 3 miles west of Abilene, Sand Springs (No. 73) is hidden by trees at the right of the buildings. Sand hills form the bluff in the distance. C, Confluence of Smoky Hill and Republican Valleys. Looking northwest from top of bluff southeast of Junction City, Junction City is in middle distance. This area is part of an older erosional plain that is now being dissected. Major streams have cut below the old plain and are now flowing in rather wide, flat-bottomed valleys. The topography of the intervalley areas is gently rolling to semirugged. The larger streams are obsequent to the rock structure and were probably superimposed upon a plain of deposition (Jewett, 1941, p. 14). Smoky Hill River heads on the High Plains in eastern Colorado, about 40 miles west of the Kansas-Colorado State line, and flows in a general easterly direction until it reaches a point near Ellsworth in central Kansas. Here its direction changes and it flows east-southeast to the northwestern part of McPherson County. An anomalous condition is presented by the river's course from this point to Salina, for it makes a broad sweeping curve to the northeast and finally flows nearly due north from Bridgeport in southern Saline County to Salina. At Salina the river makes a sharp turn and follows a seemingly normal easterly course to a point just east of Junction City, where it joins Republican River to form Kansas River (Pl. 2C). Smoky Hill River is a freely meandering mature stream whose low gradient in this area is less than half the gradient of its valley floor. It enters Saline County at an altitude of 1,280 feet and joins Republican River at an altitude of about 1,045 feet, the average gradient of the river in this part of its course being 1.5 feet to the mile. The average gradient of the valley floor through this area is 3.6 feet to the mile. The average gradient of the river above Salina is 2 feet to the mile, whereas below Salina it is somewhat less, averaging 1.4 feet to the mile. The extent of the meandering is indicated by the fact that the river travels about 150 miles in its course from the McPherson-Saline County line to Junction City, whereas the airline or valley distance between the two points is less than half this distance, or about 65 miles. Above Solomon the meander belt in most places is less than a mile wide and occupies the right side of the valley. Below Solomon the width of the meander belt increases to about 2 miles and occupies nearly the full width of the valley. Old meander scars, cut-off meanders, oxbow lakes. and slip-off slopes are common features that modify the otherwise flat flood plain. These features are well shown on aerial photographs of the valley (Pls. 3 and 4). 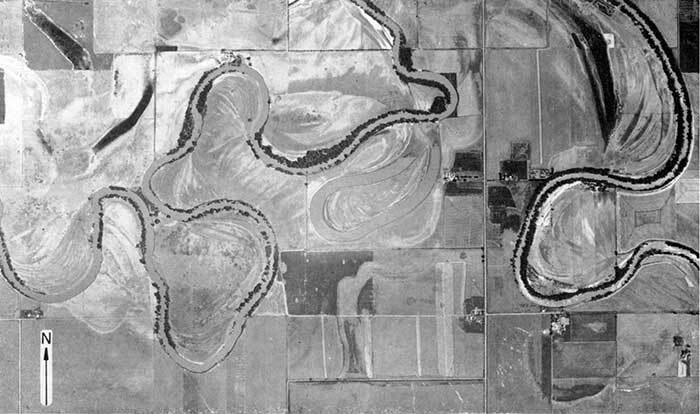 Plate 3--Aerial photograph of part of Smoky Hill Valley east of Mentor, southern Saline County, showing the meandering character of the river, old meander scars, and cut-off meanders. The arrow points north and is approximately 0.5 mile long. U. S. Department of Agriculture photograph. 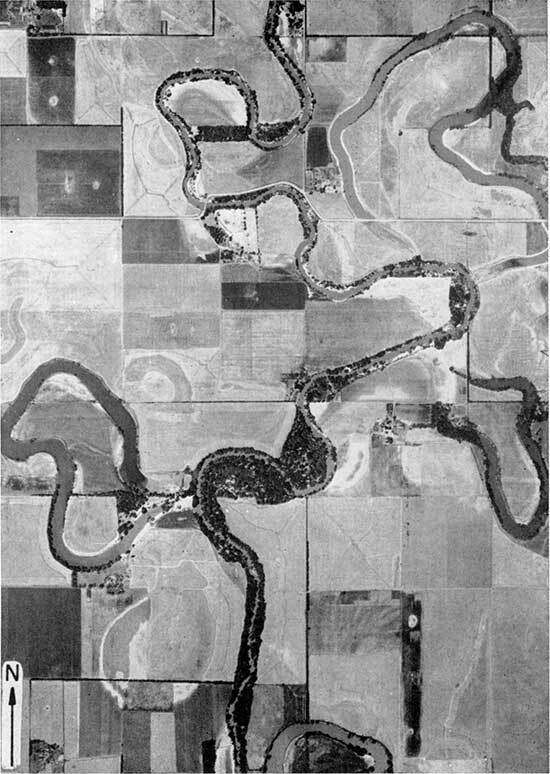 Plate 4--Aerial photograph of part of Smoky Hill Valley between Solomon and Abilene, Dickinson County, showing the meandering character of Smoky Hill River. Note the old meander scars, cut-off meanders, and slip-off slopes on the inside of the present meanders, The arrow points north and is approximately 0.5 mile long. U. S. Department of Agriculture photograph. Smoky Hill River flows in a relatively flat valley that exhibits differences in width and in the character of its bluffs as a result of the differences in the character of the rocks in which it has been cut. South of Salina the valley proper is 2 to 3 miles wide. The bluffs on the west side of this part of the valley in most places are formed by soft Permian shale (Wellington formation) and are low and inconspicuous. The slope produced by erosion of the soft shale joins the valley floor at such a low angle that in places it is difficult to determine the western border of the valley by surface inspection. The shale slope rises toward the west and merges with the Smoky Hill Buttes (Pl. 2A). The bluffs on the east side of the valley above Salina are low and have gentle slopes, but are more distinct than those on the west side. The bluffs here are formed by shale of the Wellington formation overlain near the valley edge by Cretaceous sandstone and shale (Kiowa shale). The valley from Salina to Solomon is 3 to 4 miles wide. The bluffs are composed of shale of the Wellington formation and, although distinct, are not prominent because of the gentle slopes produced by the soft shale (Pl. 5A). Between Solomon and Abilene the valley is bordered on the north by sand hills, which form low bluffs with gentle slopes (Pl. 2B). Below Abilene the valley has been cut into alternating beds of Permian shale and hard limestone (Wolfcampian Series), and as a result the valley becomes narrower and the bluffs become higher and more prominent (Pl. 5B). The width of the valley just below Abilene is about 2.5 miles and below Chapman it ranges from 1 to a little less than 2 miles. The presence of the massive beds of hard limestone has resulted in the formation of steep and rugged bluffs 50 to 200 feet high. Prominent benches are formed by the limestones at or near the top of the bluffs (Pl. 5B and C). At least one terrace occurs along Smoky Hill Valley in the area south of Salina. It is a wide terrace and lies about 10 feet above the flood plain. In many places the river is flowing against and is cutting into the edge of this terrace. Three major rivers join Smoky Hill River in this area--Saline, Solomon, and Republican. All three rivers originate on the High Plains to the west and join Smoky Hill River from the northwest. Saline River heads in southern Thomas County and follows an easterly course to its junction with Smoky Hill River a few miles east of Salina. Its valley in Saline County is 2.5 to 3.5 miles wide and has been cut through Cretaceous sandstone and clay (Kiowa shale) into Permian shale (Wellington formation). The valley has a relatively flat floor bordered by rather high, distinct bluffs having moderate slopes. The Cretaceous hills a few miles back from the river rise nearly 200 feet above the valley floor. Solomon River in western Kansas consists of two forks that head within 10 miles of each other in Thomas and Sherman Counties. They follow general easterly courses to their junction in northwestern Mitchell County. From here Solomon River flows in a southeasterly direction and joins Smoky Hill River south of Solomon. Only about the lower 4 miles of Solomon Valley is in the area studied. Here, the valley is 3 to 3.5 miles in width and its character is similar to that of Saline Valley, although the bluffs, which are developed entirely in the shale of the Wellington formation are somewhat lower and the slopes more gentle. Republican River originates in eastern Colorado and flows across the northwestern corner of Kansas into Nebraska. It re-enters Kansas near the northwestern corner of Republic County and flows in a southeasterly direction to its junction with Smoky Hill River east of Junction City. In Geary County Republican River has a relatively narrow, flat-bottomed valley that ranges from 0.5 to 1.5 miles in width. The stream in this part of its course has cut through beds of massive limestone (Permian) and as a result the valley has high prominent bluffs with steep slopes. Several smaller streams join Smoky Hill River in Saline, Dickinson, and Geary Counties. They are short local streams that range in length from 20 to 40 miles. Their valley floors are fiat to gently rolling and are from less than 0.5 mile to 1.5 miles wide. Those entering from the south include Gypsum Creek southwest of Solomon, Holland Creek southwest of Abilene, Turkey Creek south of Abilene, and Lyons Creek southwest of Junction City. On the north, Mud Creek joins Smoky Hill River at Abilene and Chapman Creek joins it at Chapman. Mulberry Creek heads in the Cretaceous hills about 25 miles west of Salina and joins Saline River north of Salina. Spring Creek, which is comparable in size to Mulberry Creek, enters Mulberry Creek from the southwest at a point about 4 miles west of Salina. At and below the confluence of these two streams the valley is unusually wide, considering the length of the streams. The valley in the area studied west of Salina is from 2 to 3.5 miles wide and is bordered by relatively high, prominent bluffs. Dry Creek, an ephemeral stream, joins Mulberry Creek about 1.5 miles above its mouth. The main branch of Dry Creek heads northwest of Lindsborg, in northern McPherson County, and follows a course nearly parallel to Smoky Hill River. A tributary branch heads in southwestern Saline and northwestern McPherson Counties and after following a northeasterly course joins the main branch about 5 miles south of Salina. Bordering the north side of Smoky Hill Valley between Solomon and Abilene is an area of about 20 square miles covered by sand hills (Pl. 1). This area is characterized by typical sand-dune topography, having moderate slopes and hills separated by small basins (Pls. 2B and 6C). Most of the area is covered by vegetation, but there are a few bare areas where the sand is being continually shifted by the wind (Pl. 6C). Parts of the sand hills are drained by small intermittent streams that flow into Smoky Hill River, but in other parts there is no surface drainage. Water from precipitation on the undrained areas collects in basins and hollows, where a part seeps into the ground to replenish the underground reservoir and part is evaporated. The sandy soils of the sand hills are especially well suited to the growing of watermelons and cantaloupes. Because of the large number of melons grown in this area, it is known locally as the Sand Springs melon district. A smaller area of sand hills covering about 1 1/2 square miles occurs northwest of Detroit (Pl. 1). Plate 6--A, Well 200 (camp well 5) south of Salina, Saline County, which furnishes part of Camp Phillips and Smoky Hill Army Air Base water supply. 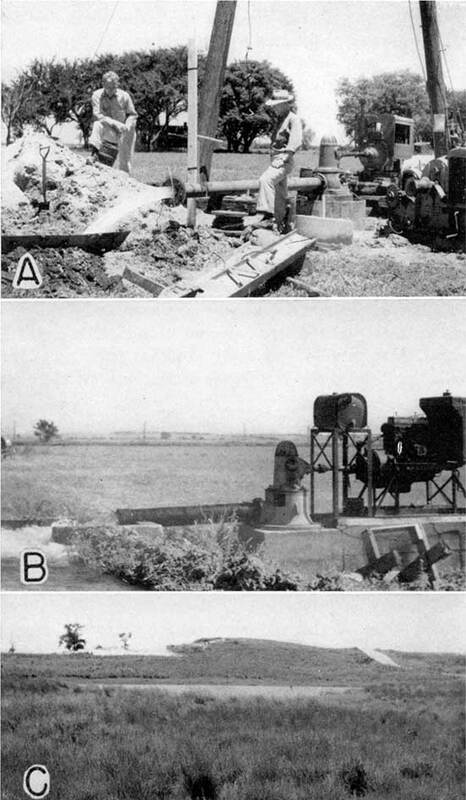 B, Irrigation well 60, east of Abilene, Dickinson county. 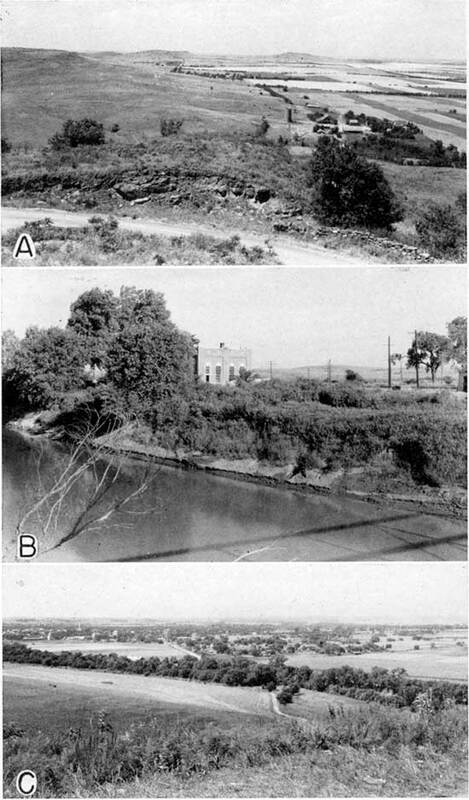 C, Small water-filled basin in sand hills, in SW sec, 11, T. 13 S., R. 1 E., Dickinson county, Note small area of bare sand in the upper left part of photograph. Placed on web Nov. 13, 2013; originally published October 1949.